What would we do without dairy in our lives? Well, with this here box you won't ever have to face that question. 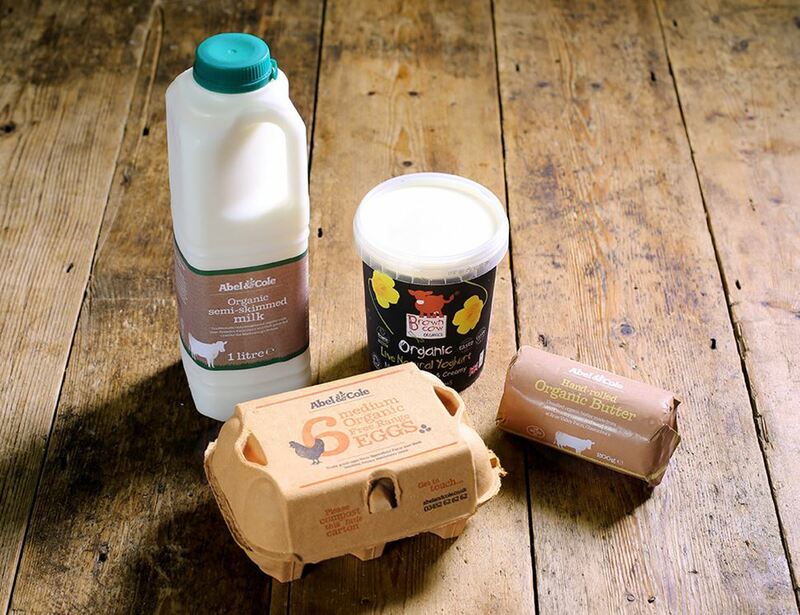 Every week you'll get organic eggs, milk, butter and a large pot of organic yoghurt, all the things you need for breakfast, baking and weekend mornings. Milk, Organic, Semi-skimmed (1 litre) - Our golden milk is produced by Guernsey and Friesian cows at Nick and Christine's farm in the Wiltshire valleys. Eggs, Organic, Free Range (6 medium) - Our organic eggs are from free range hens that roam around in the sun. Hand-rolled Butter, Unsalted, Organic, Abel & Cole (200g) - Our wonderfully fresh, rich butter is made with cream from the organic milk of Guernsey and Freisian cows. Brown Cow Yoghurt (480g) - You will receive a large pot of Brown Cow Organics yoghurt each week. Flavours will vary from week to week. Please check the box contents update each week. Our organic eggs are from free range hens that roam around in the sun, peck at an organic diet and get the benefits of free range (just like us). For allergens, including cereals containing gluten, please see ingredients in bold. * = produced to organic standards. Made with pure, organic Guernsey milk, like all Brown Cow Organics yoghurts. This rich and creamy natural yoghurt is high in nutrients, as well as delicious. A deep hue and a blueberry flavour, this thick yoghurt has a sweet twist. Made with pure, organic Guernsey milk, like all Brown Cow Organics yoghurts. This rich and creamy natural yoghurt is high in nutrients, as well as delicious. Ingredients: Live wholemilk yoghurt* (80%), Blueberry purée* (20%) (contains blueberries* (50%), sugar*, water, starch*, lemon juice*, natural flavouring). Together with Beanberry, we've made sure our coffee is outstanding in every way, from the hand-roasting to the quality.